Sri Lanka is becoming a power hungry nation. Several coal power plants with a total generation capacity of 3,200 MW are on the anvil. The country’s new energy minister, Champika Ranawaka, wants a nuclear power plant by 2025. That’s a sure sign of change: Ranawaka started his career as an activist against coal power. He was the environment minister in the last government. To be fair Ranawaka is not the first proponent of nuclear power. A year ago, at an annual meeting of the International Atomic Energy Agency, the country’s minister for science and technology, Tissa Vitarana, was convinced that nuclear power is a must for Sri Lanka. He said that thorium deposits in Sri Lanka can serve as an energy source. On September 5, the English newspaper Daily Mirror reported that the minister has invited Indian scientists to conduct a feasibility study on thorium deposits in the southern coastal belt. Ranawaka is also looking for assistance from Russian scientists. Nuclear power is dangerous, nuclear plant is difficult to maintain and waste disposal and decommissioning the plant involve high risks. The meltdown in Ukraine’s Chernobyl nuclear power plant in April 1986 is well known. According to Benjamin K Sovacool, energy expert at the National University Singapore, there have been 99 fatal accidents at nuclear power plants between 1952 and 2009. Sovacool writes that property worth US $20.5 billion has been damaged in such accidents. Since the Chernobyl disaster 57 nuclear-related accidents have occurred, two-thirds of them in the US even though it has access to the latest technology. It seems these ministers paid short shrift to economics as well. It takes more than a decade to construct a plant and it costs billions of dollars. Researchers inform that Sri Lankan thorium deposits will not last more than 60 years. So there will be added financial burden if thorium has to be imported from Russia or elsewhere. Environmental hazards of thorium mining are also well known. How will Sri Lanka handle large quantities of radioactive waste produced in the process of thorium mining? Looks like Sri Lanka has not learnt much from India’s experience with nuclear reactors. Residents in the vicinity of uranium mining sites—and the mine workers themselves—face serious health problems. It is important for countries developing nuclear power to consult their neighbours. India did not do so when it developed nuclear stations in the southern tip. A disaster in these plants might affect Sri Lanka also. And southern part of India will be threatened if there is a disaster in a Sri Lankan plant. Recently, the nuclear industry has seized on climate change concerns to override environmental safety issues. The industry claims nuclear power is an obvious solution because nuclear reactors emit virtually no CO2 at the point of electricity generation. Scientists have busted this myth. The preparation of uranium for the reactor involves a CO2- emitting processes. These include mining and enriching the fuel; construction of power stations; decommissioning of a plant; and treatment, storage, transport and disposal of nuclear waste. The complete life cycle of a nuclear power plant reveals that it is not a carbon-free alternative. Then there is the issue of liability. 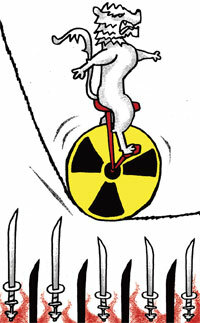 Nuclear equipment suppliers expect an immunity clause, as can be seen in the case of other countries, including India. Such clauses either limit liability to a ridiculously low amount and/or immunise private equipment manufacturers, service providers altogether from any liability arising from a meltdown or nuclear disaster. It is hard to understand why Sri Lanka is even considering nuclear power when it has sustainable sources such as wind, solar and small hydro energy. Hope ministers don’t forget energy sovereignty when dealing with energy security. the big question is that are "sustainable sources such as wind, solar and small hydro energy" enough to fufil srilankas power requirement and by the solar power is not cheap...n wind has possible side effects too.